Love this! I will be an aunt (for the first time) this summer! I am hoping to spend a lot of the summer outside with my kids! I am hoping to go camping several times this summer. That pin cushion is adorable! I am hoping to spend many hours playing in the pool with my grandsons! I plan on visiting Lake Tahoe. And visit the fabric shops on the drive up from South California. I hope to vend at more farmer's markets this summer! I'm hoping to find time to just float in the pool, nothing exciting just relaxing. My husband and I hope to build a deck on our house this summer. I'm hoping to get some sewing done for grandchildren! I hope to buy my first home! Such a cute cushion - thank you! I want to do some hiking in the mountains this summer! I'm hoping to go spend time with my grandkids this summer! Oh, Vicki! I love that pincushion! I so enjoy checking in with your blog and seeing what new quilty goodness you have going on. As for what I hope to do this summer? I'm hoping that my cancer kitties stay well enough that I can slip away for a weekend in Portland in August, when my husband and son are doing the Bridge Ride there (they close all the bridges to car traffic for this bike event). I am getting a visit from my sister and mom in June. I just found out a friend is expecting so I'm hoping to do lots of baby sewing and visiting. The girls and I are going to renovate and paint their outdoor playhouse! Thanks for the chance to win!! I hope to spend time riding bikes with my kids. I hope to be admitted to the Nursing Program at UVU (and go camping, do more studying, de-junk, sew, cross-stitch, and read non-school books)! We're hoping to trek across our state (CT) again this summer--this time by canoe. The last two summers we've done it, mostly by bike, but with a little canoeing and hiking thrown in. We're hoping to go to Yellowstone. My son is a huge waterpark fan. I hope to be able to take him to the waterpark at least once per week this summer (on average). Have a great summer! I am looking forward to going kayaking this summer. This is soooo beautiful! What a fabulous idea! This summer, our family gets to work at a Young Life camp for three weeks in Oregon...just a 5 minute walk from the beach. I am excited for lots of quality time with my three girls and my husband, soaking up the ocean and enjoying the fun at camp. I haven't made any summer plans yet, but I expect I'll have a busy time at work. That doesn't sound too fun though. I do have plenty of quilting projects to work on when I'm not at work! That's a great pincushion! Very cute!!! I am off to the wilds of Denver this summer! My kids and I just discovered geocacheing over spring break and hope to do a lot more this summer. I'm hoping to get back to the ocean this summer! I am really looking forward to the beach with my family this summer. Cute pincushion! I hope to go on vacation with my family. Cute pin cushion! I hope to spend some time at the beach this summer with my family. Thanks for the chance to win. I'd love to take my daughter to an amusement park. She's finally tall enough to ride most of the rides! I plan on making a tour of all my favorite Minnesota spots this summer -- have to sneak in one last visit before I move to Seattle in August! BBQ's bike rides and gardening for the summer. Come school time Papa and I will be traveling to Yellowstone and the south west. Hope to go visit family this summer and maybe a trip to Legoland! We're going on vacation this summer to celebrate our daughter's college graduation. Can't wait! 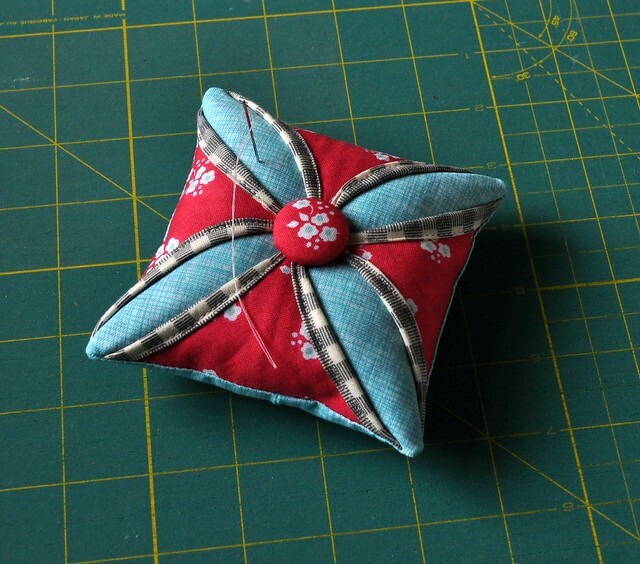 Thanks for sharing your lovely pincushion with us! The covered button just makes it. Nice work! Do some community theater with my daughter! I hope to see my sister this summer! Thanks for the chance to win such a cute pincushion! I love it! This summer, I hope to do a lot of gardening and go swimming a few times with my kids! What a lovely pincushion! Thanks for the great giveaway. I'm looking forward to spending lots of time in the park and on the bike trails with my granddaughter this summer. I hope to pick and eat lots of yummy fruit. LOVE this pin cushion. I really want to try and make a cathedral window someday. This summer, I'd really like to finish up a wedding quilt and have fun with my son at Disney World. Thanks for the giveaway. This summer, hope to go visit our Daughter in NC! Saw the ocean for first time, when we went about 5 years ago! Was soooo beautiful! Visiting family in South Carolina. Planting giant sunflowers. Having son read Harry Potter for the first time. Learning with my son on how to do still shot filming of legos and clay. I hope to be able to take a trip to Atlanta, Georgia to visit with some of my husbands family.